We quickly wanted to share this gorgeous photo that we just received from our dear friend and Berg Adventures Director of Operations Nepal, Ang Temba Sherpa. 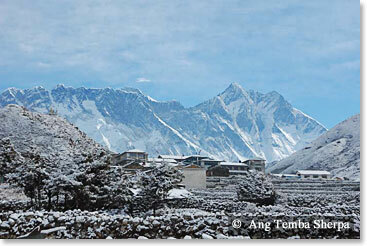 Everest’s Khumbu Valley awaits our arrival and we can hardly wait to get there. Our spring trekking team will be meeting in Kathmandu next Monday, April 25, for three exhilarating weeks in one of the world’s most breathtaking places. Follow along our dispatches as we trek through the Khumbu Valley to Everest Base Camp. This entry was posted on Wednesday, April 20th, 2011 at 2:13 pm	and is filed under Everest base camp, Expedition News.